Bloomsbury Children's Books, 9781681198828, 240pp. Born to be a tooth fairy, Cory Feathering has been busy proving she's meant for another life -one of matchmaking! It seems like everything is falling into place for Cory. Her uncle Micah is engaged to his perfect match, and she's lucky in love herself with her boyfriend Blue. She's excited to help prepare for the wedding, but when she hears of another marriage on the horizon – her mother's, to a goblin – she knows things might not go quite as planned. The fairy guilds have promised to leave Cory alone, but she knows they still don't agree with her lifestyle, so truly anything is possible. Add to that a witchy match that proves more difficult than usual and an upcoming Battle of the Bands -- and, of course, keeping the secret that she's Cupid! -- and Cory's got her hands full. In the end, will true love conquer all? This fun and joyful fourth book in E.D. 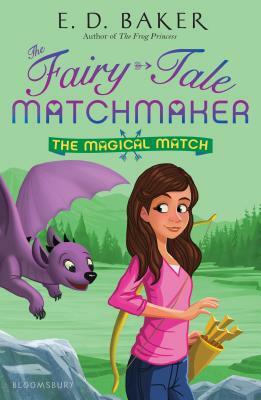 Baker's Fairy-Tale Matchmaker series is perfect for fans of fairy-tale retellings! E. D. Baker is the author of the Tales of the Frog Princess series, the Wide-Awake Princess series, the Fairy-Tale Matchmaker series, the Magic Animal Rescue series, and many other delightful books for young readers, including A Question of Magic, Fairy Wings,and Fairy Lies. Her first book, The Frog Princess, was the inspiration for Disney's hit movie The Princess and the Frog. She lives with her family and their many animals in Churchville, Maryland.